Thank you for all your suggestions. Please keep them coming as there's much I need to learn from all of you. I've been on a warpath to purge every toxic item from my bathroom. I just discovered that my favorite Eve Lom cleanser contains 5 different types of paraben. I guess one's not enough. Are you horrified yet? I am! Even Colgate toothpaste has sodium laureth sulfate. That gorgeous Phillip Kingsley elasticizer that makes my hair silky soft? Paraben and silicone. The "natural" Macadamia oil treatment my hairdresser recommended in place of Moroccanoil contains different types of silicone. Since I've adopted a minimalist approach to my wardrobe, naturally I want to do the same with my skincare. These days, we're bombarded with advertisements and clever marketing everywhere we turn. It's little wonder why we end up with piles of skincare and cosmetics, not to mention bodycare. At one point, I had multiple sunscreen lotions along with day and night moisturizers as well as cleanser, toner, serum, eye cream, various masks and treatment oils. Whew! It was a pain slathering them all on in the morning and then the drudgery process began again at night. My skin was still dehydrated. A beautician I visited more than a year ago bluntly told me that my facial skin is 10 years older than my actual age. It has taken me this hefty kick to my rear end to change my skincare routine. Thanks to my mom who introduced me to this little bottle of liquid gold - Trilogy Organic Rosehip Oil, I've done away with the rest of my skincare products. I blogged about it here last year. My fine lines are barely visible these days. For the first time, I can safely say my oily but equally dehydrated skin is now normal and luminous (never thought I'd say this!). All you need is 2 to 3 drops of the oil along with your favorite moisturizer (I'm using Sukin natural moisturizer, a gift from my mother) and massage it into your face. For those of you with kids, the rosehip oil is perfectly safe to use on babies too. I might be in a minority but I really really hate having to use the toner. My friend, Lauraloo suggested I try Caudalie Beauty Elixir. I'm hooked! I travel a lot so this helps to hydrate my skin and adds a temporary glow. I've just ordered Burt's Bees Radiance cleanser to replace my current cleanser. *sob*...I'm so going to miss you, Eve Lom. Forgive me for sneaking one last product in. 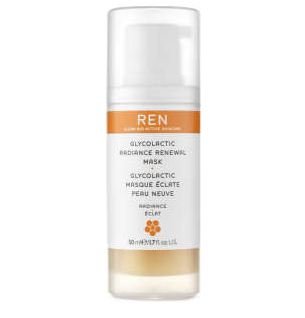 At £30 a bottle, Ren Glycolactic Radiance Renewal Mask doesn't meet my £20 and under criteria but I can't ignore the glowing reviews that I've read from various websites. This will be on my list of products to try. By the way, can anyone recommend your favorite websites that stock natural products in the US? Your last 2 posts have been eye opening. I can't believe that even Colgate isn't safe. Streamlining is a great idea. The rosehip oil sounds amazing! Have you tried any Weleda products? They have an excellent range. I'm a fan of their Skin Food cream. I started concocting my own facial masks last year from avocado/cucumber/honey and yogurt/honey. They've been great and no worries about any bad stuff there. 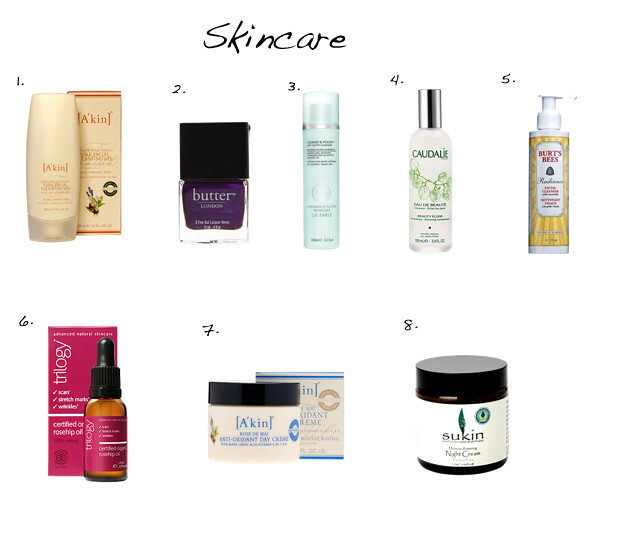 I like skinbotanica.com alot and drugstore.com also has a good natural/organic section. This is fantastic! I don't know where to start. I just purchased Clarins :(, and another reader mentioned a natural skin care line that I would like to try. I think this will be a year of trying products for me. Marlene, thanks to you I now have a great list to try from! This should be a priority for everyone. Burt's bees has toothpaste! Then there's good ol bakin soda LOL Yuck! HAHA Thanks for the suggestions M.
OH OH OH!! i will def have to try out these products.. i'm always looking to try new facial products!! but never know where to start! i have a very delicate and sensitive skin, i've been using clinique, garnier and olaz.. which are you know all pricey. i should try one of your tip!!!! btw.. i just give you an award, just check my blog dear! Starting to feel hysterical at the thought of all those nasties , ugh. I'm not going to throw away my fluoride toothpaste though : we all enjoy caries -free teeth these days ,thanks to fluoride . I M O one has to balance these things , I don't know of any ''holistic'' toothpaste that will carry fluoride . Oh, I must say a very big thankyou , I learnt a lot from you here . Just ordered the rosehip oil , it sounds just the ticket for my dry old skin!!! I now need to find a good sunblock for everyday use .Been using City Block by Clinique , and should like a change. You're welcome, Estrella. It has been a steep learning curve for me. I've just received a tube of natural toothpaste in the post. I'm going to try it this over the next few days and I'll blog about it next week. I've been using Neutrogena Sheer sunscreen for years but I haven't had a chance to check out the ingredients. loving loving loving these posts! I've been very much into natural skin care recently. totally stopped all my meds and face products. now i use honey and tea tree oil to wash my skin, and jojoba oil mixed with lavender oil as moisturiser. these are great options too, though a bit pricier! off to look at your shampoo post! You can't go wrong with Liz Earle hot cloth Cleanse and Polish: I find it a much easier to use than Eve Lom anyway and brilliant for rosacea skin. Her Superskin concentrate is a must-have (maybe it is akin to your rosehip oil). I don't bother with the toner - another bottle to dispense with - but rinse with cool clean water. Estrella, finding a sunblock without nasties has eluded me thus far - I'm still looking for a paraben-free primer with SPF20 or above. Suggestions, please! y, I suppose the nature of a sunblock is chemical, so maybe it's a difficult one . Love Liz Earle and am also a fan of these 2 products . At last something available here, Caudalie! "A beautician I visited more than a year ago bluntly told me that my facial skin is 10 years older than my actual age." Don't trust comments like that. Unless you are sun bathing everyday or using sun beds a lot I doubt this is true... Many (un)professionals will say things like that to market their services and products. Sadly, the beautician was telling me the truth instead of trying to sell me something. All the ladies in my family go to her for a facial. She's being the typical Asian - a sharp shooter, purely out of concern. She also encouraged me to look into using natural products. I love the Caudalie spritzer! It makes me so happy when flying although sometimes I find the smell overpowering, upon which I just use Evian spray. Thank you for the rose hip oil recommendation! Great post. I'm trying to follow this line of purging toxic beauty products too. I've done away with all cleansing products and am now using the oil cleansing method, and it's been unbelievable. Thanks for the rec on the rosehip oil - I'll definitely check it out! I use Excipial body lotion and Hand Cream. Okay, I need to try that Trilogy Organic Rosehip Oil. Thanks for the recommendation. I am totally loving these natural products posts! I've been doing a lot of research, but haven't heard of Sukin or Akin... so thank you! I haven't tried Rose Hip oil either. I've been using Argan oil and adding it to my moisturizer, but I just ran out. I'll be reading up on Rose Hip oil! Thanks M! I must say that I am not really that into lot's of products. I would not be the one a market company would target to sell products too.. I definitely want to try the Rosehip oil. Thanks for the info! Hi! So glad you like the blog. Your compliment is music to a blogger's ears. Caudalie Beauty Elixir is a favorite product of mine so I hope it'll work out for you too. Its' very important to know about different kinds of toothpaste. Having the right kind will definitely help you maintain your teeth.